Adam Peabody is a 10-year Global Vision veteran. He has participated in JTC Missions to Peru (2008 and 2015) and to China (2010, 2014, 2015, 2016), two APEC Summits (China 2015 and Peru 2016) and two Arctic Youth Ambassador Summits (2014 and 2015). Adam has also attended the National Youth Ambassador Caucus and Regional Round Table programs several times. He leveraged his Global Vision experience and network to become the Inaugural Investment Attraction and Growth Specialist for the City of Fredericton, where he worked to support local export companies to penetrate new global markets and secure foreign direct investment to the city from American, European and Asian markets. Most recently, Adam was appointed as the Director of Planet Hatch, New Brunswick’s flagship acceleration centre, where he leads a team dedicated to supporting entrepreneurs through innovative programming, infrastructure, and services. Adam credits his success directly to the network and mentorship opportunities that he has experienced with Global Vision, and he continues to give back to the organization as a proud Maritime alumni. 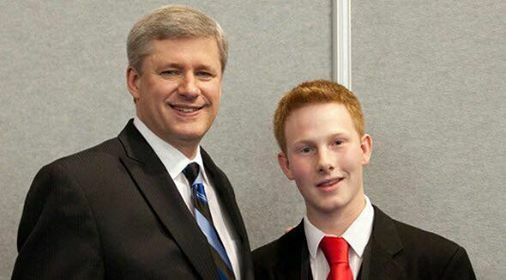 Adam (right) photographed with then Prime Minister Stephen Harper (left) during one of his Junior Team Canada Missions with Global Vision. Adam took the time to catch up with us about his GV experience and about the many opportunities that it has brought forward. With the many missions and summits that you’ve participated in, which stands out to you for being particularly memorable? Every experience with Global Vision has been memorable in it's own right, but certainly the G8/ G20 My Summits program in 2010 was particularly memorable. At the Summits, the JTC delegation was able to work hand-in-hand with fellow youth from the participating nations on international issues and develop a joint communique that we presented to our leaders. I was selected by my peers to present the G20 communique to Prime Minister Harper in person. This experience touched on critical elements of learning from all Global Vision programs and the 5 step game changer: working in a team, feeding your curiosity, relationship building, and delivering "the goods" (show & tell). And it was pretty cool to shake Prime Minister Harper and President Obama's hand on live national TV! Working for the City of Fredericton, can you explain your role as an Inaugural Investment Attraction and Growth Specialist? As Investment Attraction & Growth Specialist I put my learning experiences from Global Vision into practice each and everyday. I am responsible for working with our provincial and national partners to pitch Fredericton as an investment location of choice for growing multinational companies. I work with our community partners to refine, market and sell our value proposition to encourage foreign direct investment from around the world. Once the investment is made, I work with local management to ensure they are connected to subject matter experts that will assist them in maintaining and growing their investment in our city for local economic prosperity and job creation. Adam (left) and Amy Clifford (right), Director of Global Vision, photographed with Prime Minister Justin Trudeau whilst representing the organization. Having been appointed Director of Planet Hatch, how have your experiences with Global Vision allowed you to excel in this position? Have you learned anything that has helped you succeed in this particular field? Upon my appointment as Director of Planet Hatch, I relied on a different set of Global Vision experiences and skills I developed in the program. In this role, I am responsible for managing a team dedicated to the growth of New Brunswick's startup community. We offer programming, services and creative infrastructure to help entrepreneurs scale up their startups. In this role, it is imperative to use group dynamics, presentation and pitching skills, creativity, and leverage a golden rolodex. All of these skills I learned through my involvement with Global Vision. You mentioned that you’re still consistently involved with Global Vision, even with years under your belt. What does your current involvement consist of? Global Vision is like a family. As an alumni (just like a family member) you still remain connected with a desire to help each other no matter the distance between you. Since returning to my hometown of Fredericton I've remained active in Global Vision by supporting and coaching local JTC ambassadors, participating in the National Youth Ambassador Caucus program, and other initiatives to help to give back and pay it forward. I will never be able to fully pay back to the organization all that is has given and done for me! Crediting Global Vision’s network and opportunities for leading you, how has the organization helped your achieve success in the many facets of your life? Certainly the skills development through learning by doing has been instrumental in my personal development. You're not just being taught what to do at Global Vision, the program gives you the opportunity to put what you learn into practice and succeed or fail on your own. The program also connected me to hundreds of like-minded youth that became great friends, many of whom I am still in touch with today.... I always have a couch to crash on or a friend to grab a coffee with, no matter where I am in Canada! Moreover, Global Vision opened my eyes to the possibilities the world has to offer. I entered the program as a young guy from a small town with little international experience. I now have a much greater appreciation for the different cultures, perspectives, and opportunities that are available and the confidence to go out and seize them. 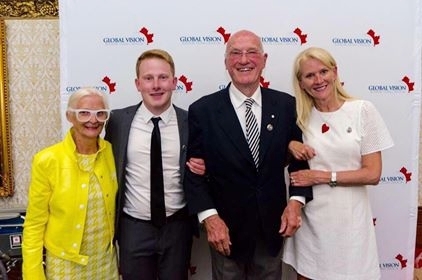 Peabody (centre-left) photographed Global Vision founder Terry Clifford (centre-right), Terry's daughter and GV Director Amy (right), and his wife Ann (left). 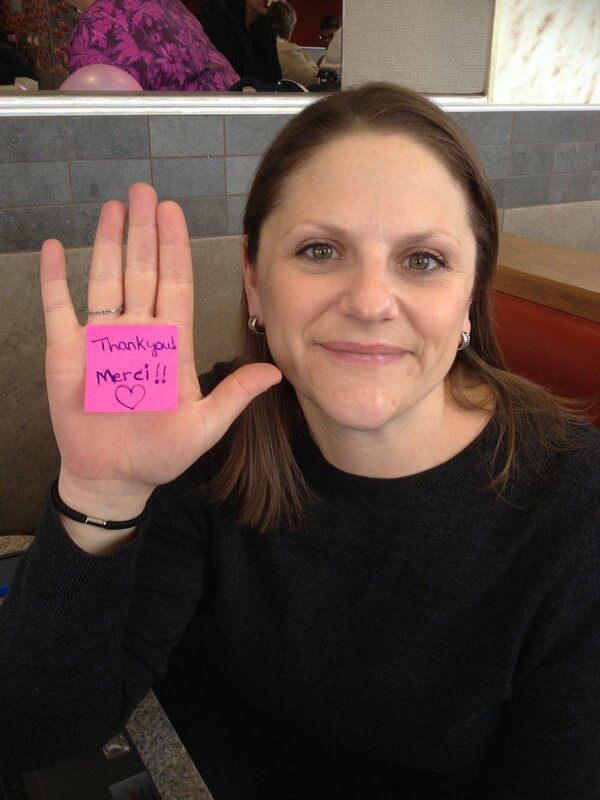 As a 10-year veteran, what has inspired and motivated you to stay involved with Global Vision? In other words, what has kept you coming back? My inspiration for staying involved with Global Vision comes from it's leaders: Terry and Amy. They have given decades of their lives, often with little recognition or benefit, to providing young Canadians with incredible, life-changing opportunities. Their dedication to the organization and the participants it serves is incredible. If there is any way that I can give back to them, I want to do it. Do you have any final words of advice for anyone who is trying to build a long-term relationship with an organization or a company — whether it be Global Vision or another? My advice would be to work hard, be honest, and treat others as you would like to be treated. Pretty simple rules we are all taught in kindergarten or before, but too often individuals lose sight of these golden rules in the hustle and bustle of their daily lives. But if you follow them, the rest will work itself out. 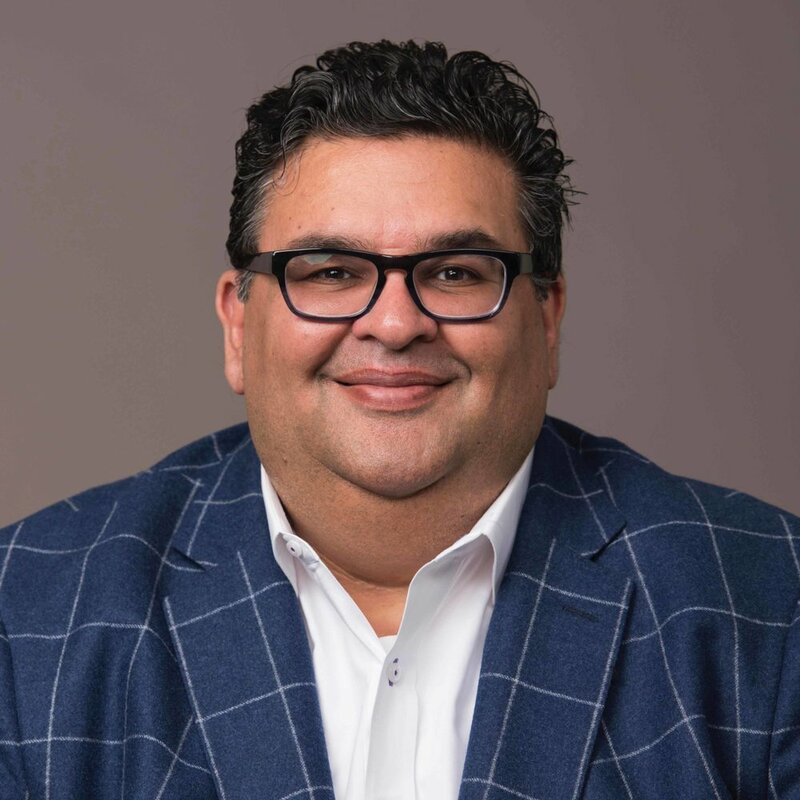 As a member of the first Junior Team Canada delegation in 1991, Mahesh Uttamchandani has been actively involved with Global Vision for nearly 30 years. He has pursued an impressionable career in international trade and business, working with the World Bank across the globe. We had the pleasure of catching up with Mahesh and of learning about his incredible journey. As a JTC Ambassador from Global Vision’s very first delegation in 1991, it is quite impressive that you’ve kept in touch with the organization all of these years. Can you elaborate on the 1991 Mission and on your involvement with GV? The 1991 Mission was, to my understanding, completely unique. Terry was an MP at the time and he had garnered support for GV from Prime Minister Mulroney and others in the federal government at the time. It also took place in the lead up to Canada 125. So, the purpose was both to foster some degree of unity across Canada (by proportionally pulling in GV participants from all provinces and territories) and to foster international trade by teaching delegates (all of whom were high school students) about international trade. How would you describe your experience with GV then, and how has it impacted your life to this day? Is there a particular piece of knowledge that you learned that you’ve brought forward with you? Looking back, I can see how, in many ways, GV set my life on a different trajectory. At that stage in my high school career, I was pretty sure I wanted to be a lawyer. It’s hard to imagine today but, at the time, Canada – despite being so diverse - was a fairly parochial place. Most Canadians did not speak a language other than English or French and most did not actively travel outside of North America. GV exposed me both to formal learning in economics and to the sort of informal learning that comes with travel. It really did imbue in me a passion for globalization (at a time when we didn’t even use that word) and for understanding Canada’s role in an increasingly ‘flat’ world. It also took place at the same time that the war in Yugoslavia was just developing and the Euro was starting to be rolled out. These were developments that were highly significant, globally, but that most Canadians were not particularly well informed of. While I did end up studying and practicing law in Toronto, the hunger for a more global role that GV planted in me, led me to a more international career. On a very personal level, growing up in a very working class part of Scarborough (a Toronto suburb), I had never imagined going to a university like Queen’s (which, at the time, was a fairly wasp-y place). As part of our GV training, we spent a week at Queen’s and I fell in love with the university and ended up going there for my undergrad. I also made friendships through GV that are still very important to me today. You mentioned that you are currently working with the World Bank across the globe. What does your role consist of? I’ve had several roles at the World Bank but, currently, I manage a team of 50 staff, spread across 11 global locations from Washington to Sydney, that provide expertise to national governments on financial infrastructure and access to finance. This includes areas such as: digital financial services, mobile money, payment systems, consumer financial protection, credit information, bankruptcy and asset-based lending. My team is currently active in about 100 countries – spread across all regions of the world. What is the most culturally interesting country or city that you’ve been to, and why? This is a tricky one. I’ve had the good fortune of travelling to over 95 countries and have visited many interesting cities – and more importantly, worked with so many interesting people – in my time at the World Bank. Before my current position (which is more management focused), I was a senior technical expert and often worked with bankers, lawyers and judges in the countries that I travelled to. The legal and banking communities in different countries are so interesting and are such a reflection of the culture of their respective countries. This has been one of the most interesting things for me to experience. If I had to choose, however, I would probably say Johannesburg. South Africa is such an amazing country (both naturally and culturally) and has such an interesting and challenging history. The people of South Africa that I have met and worked with over the years are some of the hardest working, smartest people I have known and, crucially, have the best sense of humor in the world! What inspired you to pursue a global career? A big part of it was sparked by GV as I said above. Canada definitely punches above its weight in the sphere of international organizations and it played a big role in shaping some of the legal reform work being done in Europe after the fall of the Berlin Wall. In the early 2000’s, Canada was helping support an initiative at the EBRD in London (the European Bank of Reconstruction and Development) that promoted commercial law reform in emerging markets in Eastern Europe. As a Canadian lawyer, I jumped at the chance to be part of this and was asked to move to London to work at the EBRD for 2 years to pursue this work. My law firm was kind enough to give me a leave of absence and my wife was able to get a transfer to London with the global accounting firm she worked for. After doing that for two years it was like my entire world and frame of reference had changed. I was exposed to the world of international development in a way that I could not have dreamed of. Although we were scheduled to come back to Canada after the two years, I was recruited to the World Bank and the rest, as they say, is history. How would you advise someone aspiring to build an international profession and a global network? Are there any particular skills that should be developed, or opportunities that should be looked out for? I think we sometimes misunderstand ourselves in Canada or, at least, the perceptions people have of us. Although we are such a diverse country and so many of us have strong connections to different parts of the world due, in part, to our own heritage, we are still seen as a country where – much like the US is seen – people don’t venture too much beyond their borders. Today, when I get resumes from young people, often by the age of 25 they have lived, studied and maybe even worked in 2 or 3 countries. Canadians, by contrast, tend to stay close to home (maybe because we have such a great country!). So, I tell people, look at your resume and imagine that the person reading it is skeptical of Canadians and their knowledge of the rest of the world. What is on your resume that will dispel that skepticism? If you did your undergrad in Canada, did you also stay there for grad school? If so, why? What says ‘passion for global work’ on your resume? Have you only ever worked in Canada? Are you fluent in any languages? One of the greatest achievements of the last 25 years, in my opinion, is the lifting of hundreds of millions of people out of poverty and into the global middle class. A consequence of this, however, is that young Canadians looking for an international career need to compete in a way that they probably didn’t have to a generation ago. Kids in China, India and elsewhere are not only getting a great education at home, they are then leaving home to study and work in universities and companies that have truly global brands and provide them with platforms for which to have a more global career. Young Canadians need to think about competing in that kind of world. Finally, do you have any specific goals or plans that you intend to accomplish in the future? In other words, what’s next for you? It sounds scary to say but, as I’m turning 45 this year, I’m into the back half of my career. I’m really excited about the technological changes that are happening in the world of finance, particularly around mobile money and the use of mobile technology to bring financial services to people who have never had this kind of access (the poor, those living in rural areas). I’m really excited about continuing to learn – particularly from younger people – about these new technological innovations and helping to bring them to the poorest and least served parts of the world. Personally, I’ve discovered that I have a real passion for managing people. 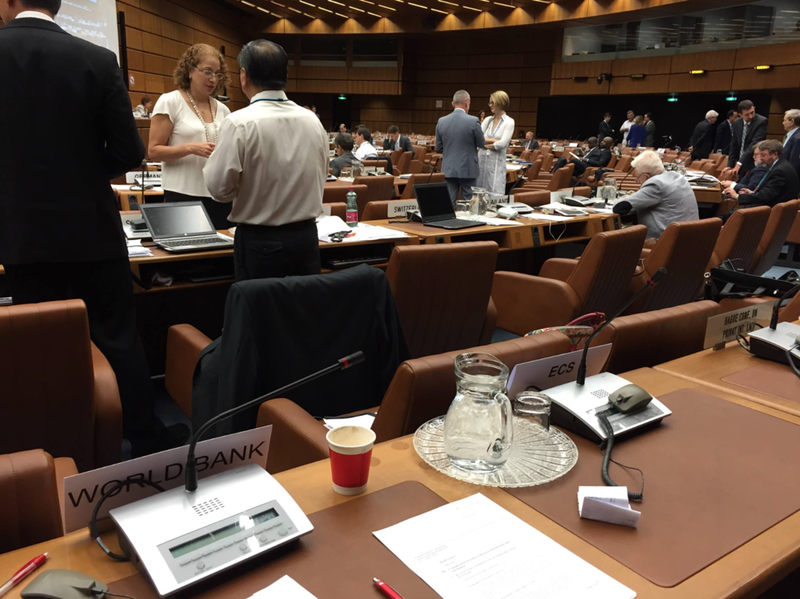 Going forward, I see my contribution to international development relating more to effectively managing teams – and helping my teams deliver effective results. As a proud JTC Ambassador on the 2017 Mission to China, Chris partnered with the Province of PEI and delivered key contacts to the Premier for the integration of UnionPay financial services into the Province’s tourism sector. Chris also worked with Global Affairs Canada to pitch Canada’s investment opportunities at the 2017 APEC CEO Summit in Da Nang, Vietnam. 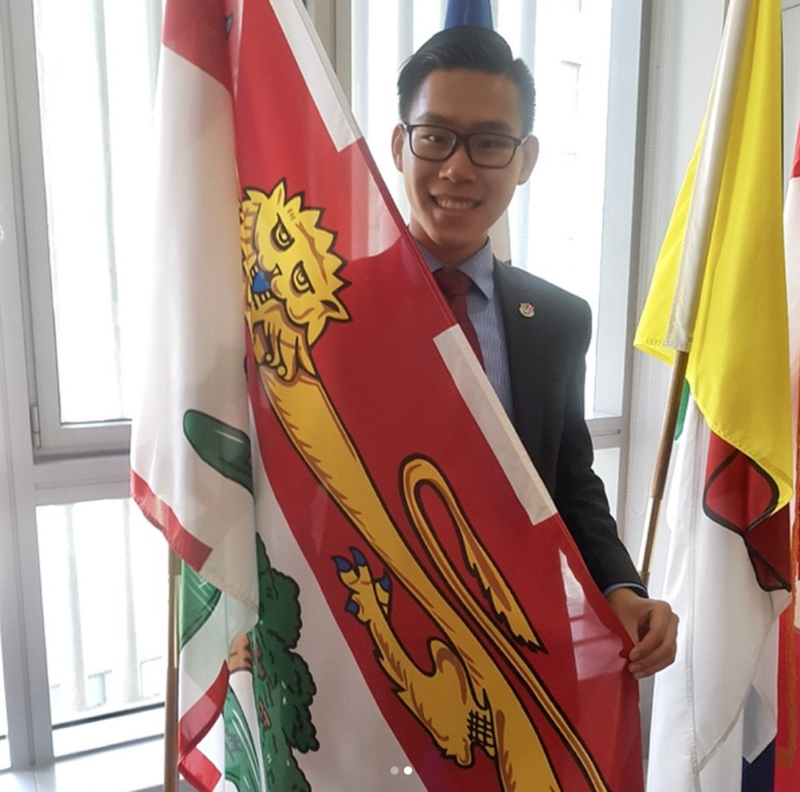 Chris has become an alumnus of the Prime Minister’s Youth Council, which he joined prior to embarking on his GV journey, and was offered a Global Expansion Consultant position with Invest Ottawa through his Global Vision network. 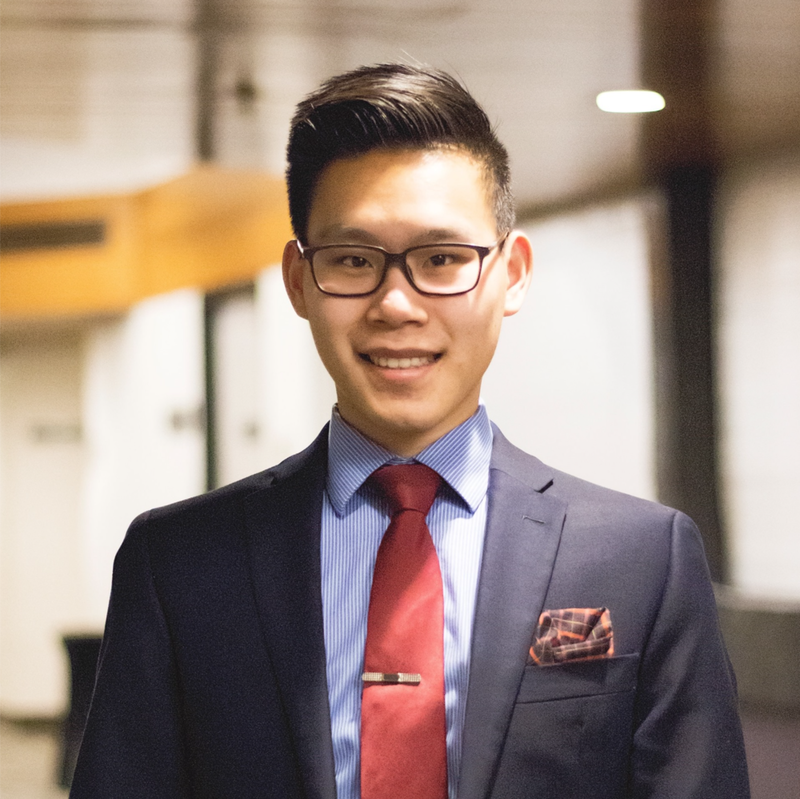 Chris is currently studying Health Sciences at McMaster University and will soon be embarking on an exchange to Tsinghua University in Beijing. 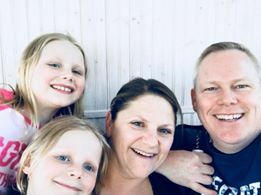 We sat down with Chris to learn more about his experience with Global Vision and in the global marketplace. You’ve been involved with Global Vision in many ways. How would you describe your experience — from the Round Table Series and NYAC, to the Mission to China and APEC Vietnam? It was a blast! I met so many fantastic people and learned so many important skills. Besides the hard work that all ambassadors put in towards advancing Canada's presence in world trade, we also had lots of fun. One particularly memorable moment was in Vietnam when our delegation was on our way to meet with Prime Minister Justin Trudeau. Due to the typhoon, our side of the road was blocked. To our surprise, the driver of the government bus (which had disco lights...obviously) swerved into the incoming traffic and stuck his hand on the horn. So there we were, prepping our meeting with Prime Minister Trudeau in a disco bus, honking through a sea of incoming traffic. Don't try this at home. 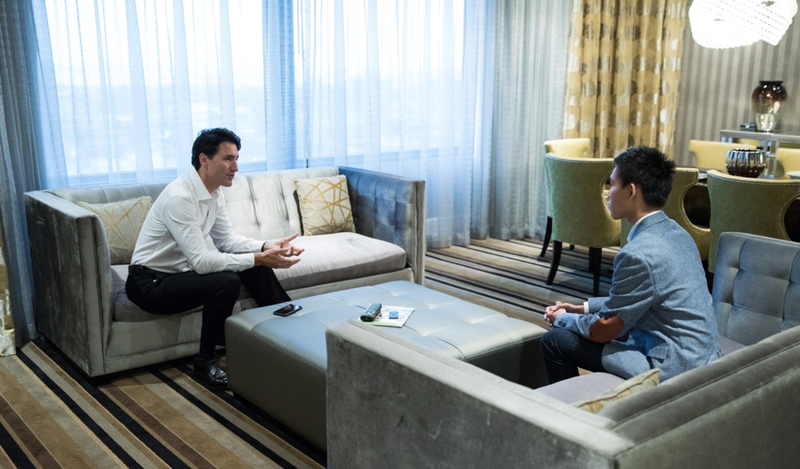 Given your work ethic and success in China, you were given the opportunity to travel to Vietnam for the Asia-Pacific Economic Cooperation Summit shortly afterwards. Can you tell us a bit about your experience interacting with world leaders? For the past two years, you served as a Member on Prime Minister Trudeau’s Youth Council. What did your role consist of and what did you enjoy most? My role on the PM's Youth Council was to provide non-partisan policy advice to the PM and to other senior government officials. It was a great opportunity for me to share my experiences and values with top decision-makers; simultaneously, it was also a marvellous way for me to learn about policy and politics. I enjoyed exploring topics such as reconciliation, the struggles of Phoenix, and the art of networking with important people. Have you been able to transfer any of the skills that you’ve developed with Global Vision to this national scale? Absolutely! One of the most important skills I learned through Global Vision was networking. Starting from my first Round Table in Toronto, GV encouraged me to network with complete strangers. From entrepreneurs in Chengdu to CEOs at APEC, GV gave me unique opportunities to practice my networking skills on a global scale. When it comes to advocating for policy, talking to the right people is surprisingly important. Luckily, GV taught me how to navigate my way around the complex networks of policy makers and have meaningful conversations with them. While your involvement with the Youth Council is quite demanding, you are also a Global Expansion Consultant for Invest Ottawa. How have your ties with Global Vision fuelled this opportunity? At the start of May, I was panicking — despite my good looks and charm, no one wanted to hire me. Then I randomly came across a Facebook notification from the (legendary) Adam Dewar in the GV Grad group. His organisation was looking for a business development manager. I messaged him about my experiences with GV in China and APEC and asked if he had a summer position available. I must have done something right in a past life, because Adam introduced me to the VP of Global Expansion who, after an interview, offered me a consultant position. So that's how I ended up at Invest Ottawa — through the GV family. 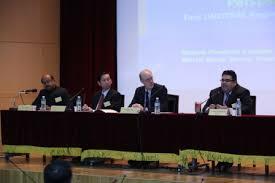 You mentioned that you’re about to embark on a full-year exchange with McMaster to Tsinghua University in Beijing. Why did you decide to return to China, rather than exploring a new country? I originally had no plans to return to China, nor to do an exchange at all. But the JTC Trade Missions opened my eyes to the incredible opportunities that are out there. Chatting with accomplished youth from other APEC countries inspired me to study abroad, and networking with top Chinese business executives convinced me that understanding the Chinese business environment will open the most doors. Do you have any advice for incoming Ambassadors? The advice I always give to young professionals is "ask and you shall receive". There are many opportunities out there, but you have to actively go and pursue them. I would never have been offered my job with Invest Ottawa if I hadn't randomly messaged another GV grad. When you see an opportunity, even if you don’t think you're qualified, go for it! The worst thing that can happen is adding another HR manager to your growing network. Jennifer (Cleversey) Moffitt is a Vice-Chair of the Worker's Compensation Appeals Tribunal in New Brunswick and a member of the Canadian Social Security Tribunal's Appeal Division. She holds a Bachelor's in Political Science, an MBA, and a law degree. She was probably the inspiration for Suits, too. 1994 was an eventful year: NAFTA was signed, China got its first internet connection, and, most importantly, Jennifer began her GV journey at a Round Table in Nova Scotia. At the age of 16, Jennifer represented the Nova Scotia Department of Environment on the Trade Mission to Taiwan and Hong Kong. While in Taiwan, she identified the shortcomings of their waste water treatment system and facilitated a technology transfer between Nova Scotia and the local government. We had the privilege of chatting with Jennifer to learn more about her GV journey. What was your experience with Global Vision? Jennifer explained that Global Vision has played an instrumental role in her career. Through GV, she developed a better understanding of the people around her. "A lot of my work is decision making," she said, "my experience [through GV] has allowed me to see the world with humility and sensitivity to what other people are going through and their perspective". Do you have any advice for recent GV Graduates? Jennifer affirmed "be adventurous, in all parts of life! Don't say no to trying new things such as a university course, travel, or a career that wasn't contemplated at the beginning of your journey. Life offers you opportunities – don’t dismiss something just because it wasn’t on the initial plan." Reflecting on her own education and career path, she revealed "life throws you things; there is cool stuff out there!" Thank you for leading by example, Jennifer!